Explanation: NGC 4631 is a spiral galaxy found only 25 million light-years away, toward the well-trained northern constellation Canes Venatici. Seen egde-on, the galaxy is similar in size to the Milky Way. 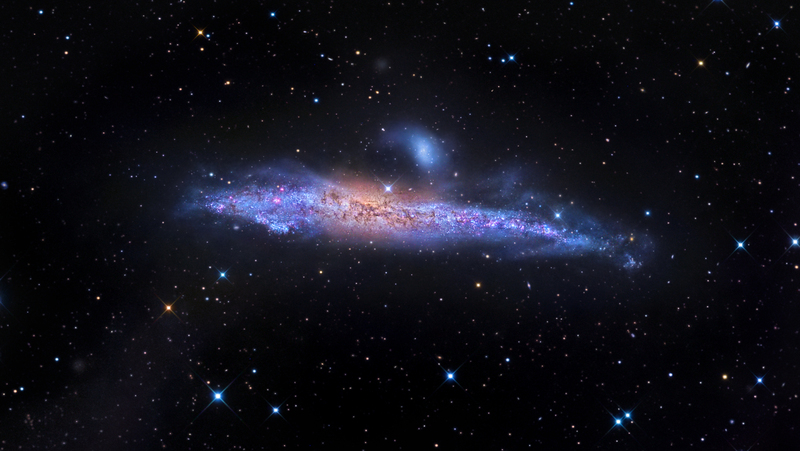 Its distorted wedge shape suggests to some a cosmic herring and to others its popular moniker, The Whale Galaxy. The large galaxy's small, remarkably bright elliptical companion NGC 4627 lies just above its dusty yellowish core, but also identifiable are recently discovered, faint dwarf galaxies within the halo of NGC 4631. In fact, the faint extended features below (and above) NGC 4631 are now recognized as tidal star streams. The star streams are remnants of a dwarf satellite galaxy disrupted by repeated encounters with the Whale that began about 3.5 billion years ago. Even in nearby galaxies, the presence of tidal star streams is predicted by cosmological models of galaxy formation, including the formation of our own Milky Way.